First, THANK YOU to each of you for your part in making Voices from War a successful reality, whether you are a veteran participating in our weekly writing workshops or an engaged civilian, veteran, or veteran service provider receiving our updates – and listening for more veteran stories. Perhaps you were able to attend our recent event, “Journeys in Stories,” in collaboration with non-profit arts organization Veteran Artist Program. The Voices from War Literary Showcase, which was followed by another powerful ensemble performance by The Telling Project, was a fantastic success – engaging, thoughtful, thought-provoking – with an audience of over 200! We can’t wait to tell you about each of the exciting projects we are working on, with the Voices from War writing workshop always at our core; a place to write, to reflect, to engage, in a community of fellow veterans, writing. I am writing to you today to ask for your ongoing support on this “Giving Tuesday.” Our writing workshops continue because of your support. We are launching our first Voices from War crowdfunding campaign next week through Indiegogo – and we need your support, whether in the form of a modest contribution, help spreading the word, or both! Voices from War, from our start in 2013, has relied on word-of-mouth support, whether through participants in our writing workshops, friends and colleagues, veterans, or others who work closely with veterans. And we take pride in building community through you – whether you are a veteran, or a civilian, or a military family member. Whether you are a reader or a writer. Whether you work actively with or for a veteran service organization or are in the military, or whether you are not even sure if you know a recent veteran, yet. All of us count on the capable hands and minds of veterans, their strength and resilience, and their service. Their return to civilian society and the richness of their ongoing contributions matter deeply to each of us, to history, and to our literature. Whether someone served recently in Iraq or Afghanistan, or decades earlier in Vietnam, whether in Korea or Europe, or in regions and conflicts to which we have paid less heed – their stories matter, their voices matter. Without them, we know far less of the firsthand realities of war and military life – the camaraderie found in struggle, the pain of violent loss, and so much in between. Their stories are human stories; and from war stories, we understand more of ourselves. Stories deepen our humanity. Telling stories, sometimes just for ourselves, sometimes for a wider audience, brings us closer – to ourselves, to understanding complex experience, and to others. Writers and readers. Veterans and civilians. People. I am asking you today to take a moment, to consider all of these stories, how much our own stories matter to us; how much the stories of others – whether told through the truths of memory or the different truth of fiction – enrich our lives. Your attention matters; and in this season of giving and giving thanks, your gift, however small, makes a difference. Whether you can give $1, $10, or $100 – even if you find you cannot make a contribution at all right now – please share our campaign and please share in the work of Voices from War. We could not do it without you. Want to know more about Voices from War and what we do? We are concluding our third season of writing workshops for veterans at the 14th Street Y in New York City, and getting ready for our next season, Winter-Spring 2015. We just held a fantastically successful Literary Showcase, part of the 2nd Annual VAP Veterans Week Showcase, in collaboration with veteran-arts non-profit Veteran Artist Program – “Journeys in Stories: From the Front to the Home Front in Words” – and we are finishing editorial work on our first Voices from War literary journal – Volume 1 of writing from workshop participants! We can’t wait to share work from these fine writers – fiction and non-fiction from veterans of Iraq, Afghanistan, Vietnam, and even Korea. Please visit our website, and check back on the site, the Voices from War blog, and our Facebook page for more updates! And, again, thank you for all you give – by listening, by writing, by contributing however much or little you are able, and by sharing in the importance of our work; by sharing in valuing the importance of these voices. 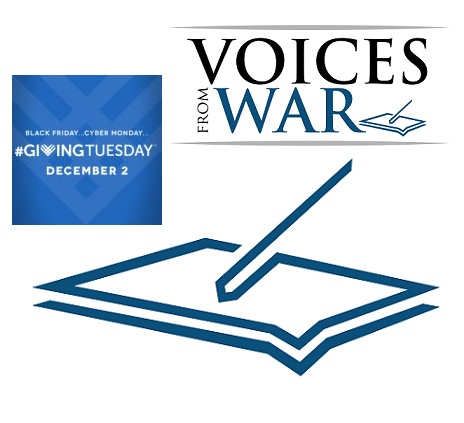 I pledge a 2014 donation to Voices from War for ($ )... $10 $20 $40 $100 Or, fill in your preferred value below. Thank you! Or, you can fill in your preferred pledge amount here. Thank you! Or Donate Now – through Fractured Atlas, our fiscal sponsor. THANK YOU for supporting Voices from War!